One of the most exciting things we do at NCC happens on Christmas Eve! Every year, we collect our “Giving It All Away” offering to fund our outreach ministry called “Five.16”. Matthew 5:16 says, “…Let your light shine before others, that they may see your good deeds and glorify your Father in heaven.” Matthew 5:16 is about putting our faith into practice so others may see the love of God, that is why we call our outreach “Five.16”. It is our sincere hope that 2019 expands our outreach by helping many people with spiritual, physical and emotional needs. There are many young Coast Guard men and women stationed here in Elizabeth City for training, drawing them away from home for extended periods of time. We have the opportunity to show hospitality by serving a meal to each “A-School” student during a church-wide event next year! Many students at ECSU have significant financial need. These needs place an added strain on practical essentials, such as hygiene and back to school items. We’re working with ECSU to discover the best ways to alleviate some of these needs. We’re making a one-time donation to Maritime Ministries of $500. This ministry is based out of MACU and spearheaded by Dan Smith, Interim Vice President of Institutional Advancement. Maritime Ministries is an evangelistic outreach using sailing to build relationships and have conversations about faith. We have a year-long plan to serve the residents of Virginia Dare apartments in Elizabeth City. All residents at Virginia Dare Apts are elderly with significant financial need. NCC will coordinate groups of people to serve and minister to them in a variety of ways throughout the year. This project entails packing and distributing Christmas dinner packages to some of Elizabeth City’s citizens without resources for enough healthy food. We’re sponsoring five Cuban Pastors’ work again this year. The church is growing in Cuba! We hope to continue sponsoring Cuban pastors and their thriving ministries there. On a side note, two of our elders will travel to Cuba in March to see the work God is doing there first hand. Additional funds​​ are used for disaster relief and other practical needs within our church family as needed. 100% of this offering is given away! We hope you will prayerfully consider how to support this offering. Donations can be made during one of the Christmas Eve services, by texting the dollar amount to 84321 with the keyword GIAA and selecting New Community Church if prompted, or online HERE. To find out more about our Christmas Eve services, you can go HERE. Our next baptism will be on Sunday, November 4, 2018 during our morning worship services! If you are interested in being baptized or if you have questions about baptisms at NCC, just click here. You can also pick up a baptism packet at the Information Center on Sunday mornings. Please be sure to complete the necessary steps at the link above by Sunday, October 28th. Due to the predicted weather from Hurricane Florence, all services and activities at the church are cancelled for Sunday, September 16, 2018. This includes the morning worship services and Student Rev. If you experience any damage from Hurricane Florence and you need assistance in removal of debris, please e-mail info@newcommunitychurch.net. Please understand that we may not be able to get to you until it is safe to do so. Please stay safe! Stay tuned to this page, along with our pages on Facebook and Instagram, for more updates! 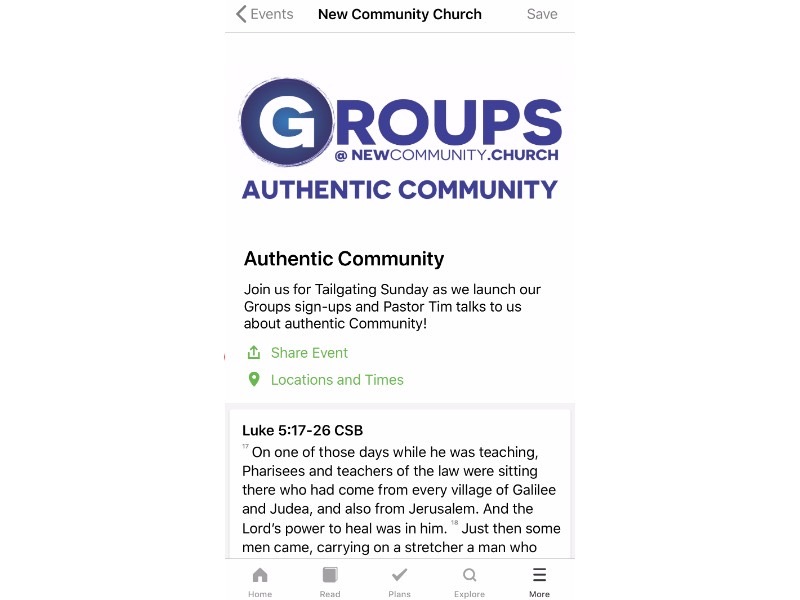 Last Sunday, we officially announced a new resource that we are starting to use on Sunday mornings. 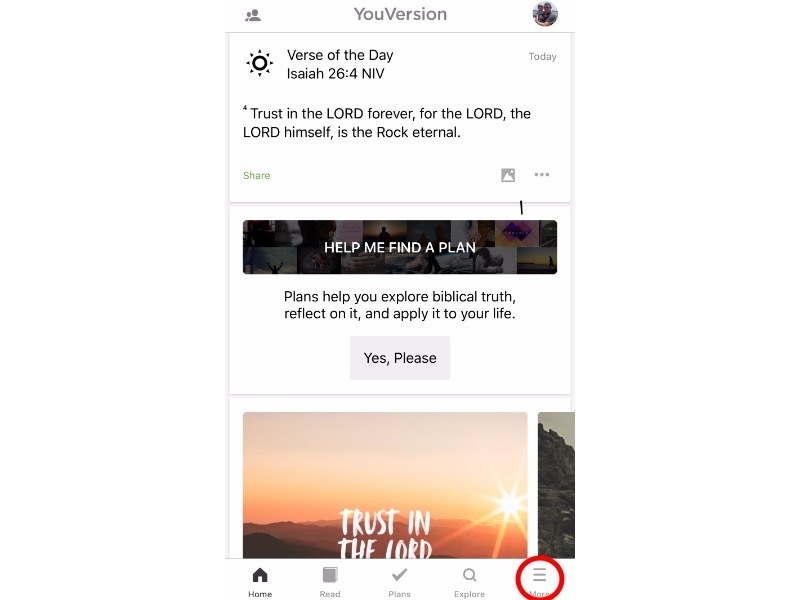 On YouVersion events, you can find the scriptures that we are using, points from the message, other important information, and you can add your own notes as well! 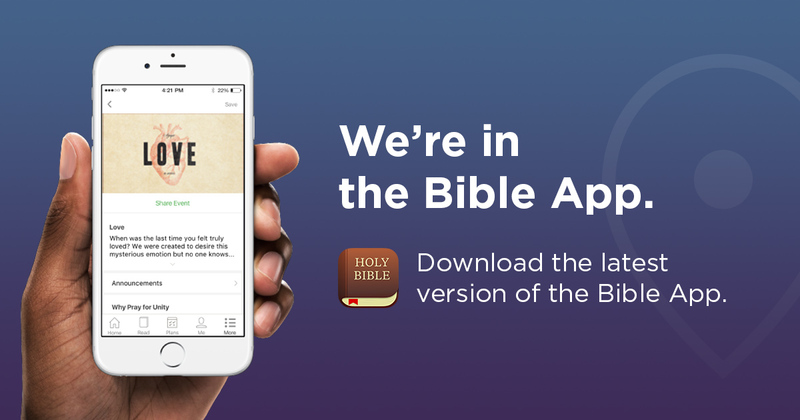 If you do not have the Bible app, it is a free download! You can download the app on Apple, Android, or any other smartphone device. Once you open the Bible app, you will be on the main screen. Click the 3 lines on the bottom right, which is the MORE option. 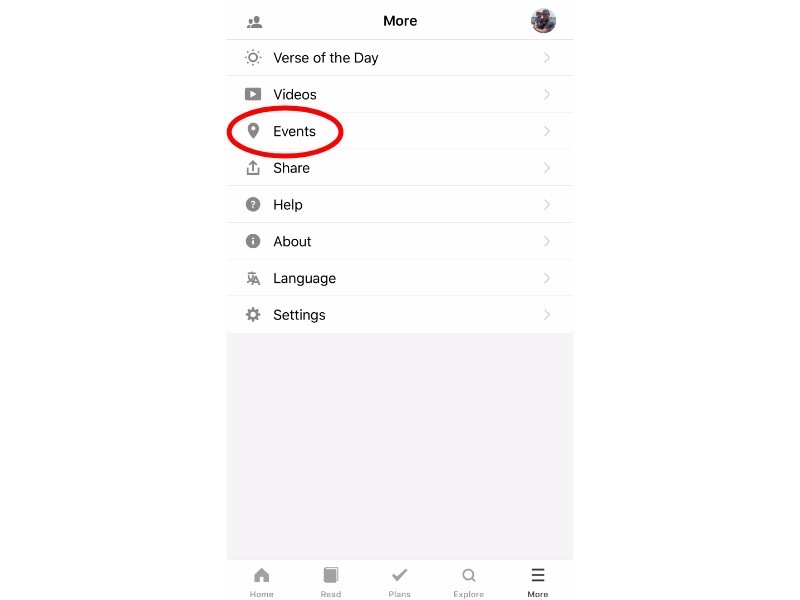 On the next page, click on EVENTS. 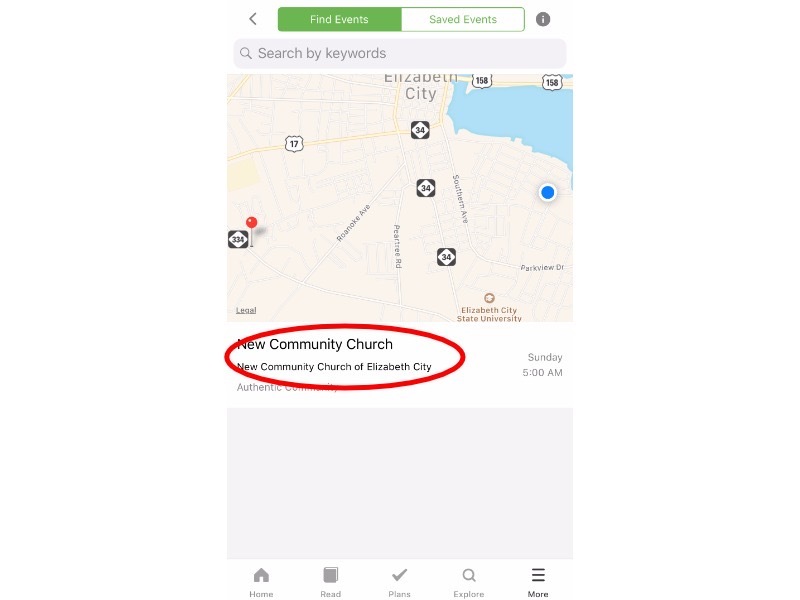 Select the NEW COMMUNITY CHURCH event. You can scroll down to follow along and make notes. On the top of the event, you can click on SAVE so you can look back at your notes later. Even if you’re not in town, you can see what we are talking about during a weekend service so you don’t miss a thing! 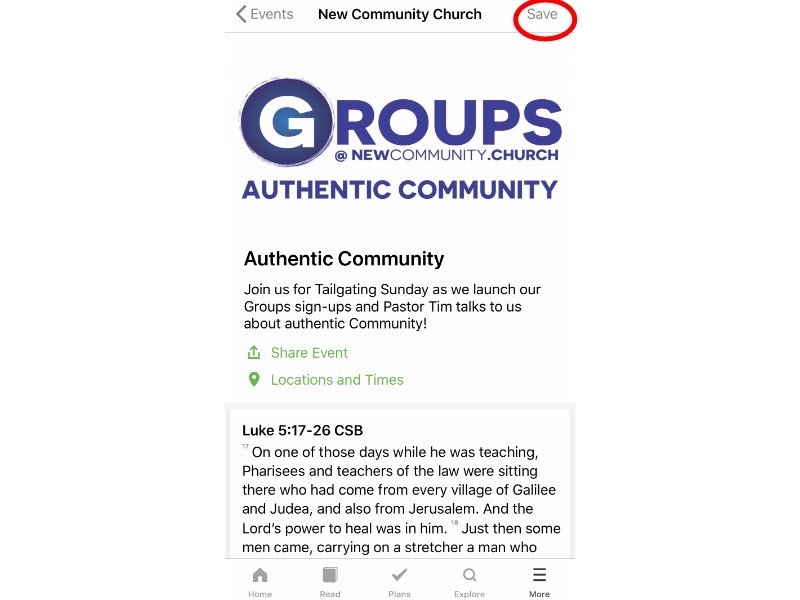 New Groups – Fall 2018! What is this group about? How we can stop trying so hard as women. Who is this group for? Women in their mid-20’s and older. When is this group happening? Sundays from 3:00-4:00 PM, starting October 7th. Cost? Price of the book. What is this group about? An investigation into Christianity for those who are seeking faith, or whom have big barriers to it. When is this group happening? Mondays from 6:30-8:30 PM, starting October 1st. What is this group about? A couples’ study and discussion using a video-based series, based on Shaunti & Jeff Feldhahn’s study. When is this group happening? Mondays at 6:30 PM, starting October 1st. Cost? $27.00 for books and guide. What is this group about? Dinner and discussion based on Andy Stanley’s marriage study. When is this group happening? Tuesdays at 6:30 PM, starting October 9th-November 20th. What is this group about? Seeking God’s Word to equip and prepare us in accepting challenges men face in today’s world. When is this group happening? Tuesdays at 7:00 PM, starting October 2nd. What is this group about? Bible study throughout the book of Acts. When is this group happening? Wednesdays at 6:30 PM, starting October 3rd. What is this group about? A group for women desiring to know Jesus more through Bible study and friendship. When is this group happening? Thursdays at 9:30 AM, starting October 4th. What is this group about? Devotional and Bible Study with hands-on projects. When is this group happening? Thursdays at 7:00 PM, starting October 4th. What is this group about? A group for parents to discuss parenting through stages. When is this group happening? Thursdays at 6:30 PM, starting October 4th. What is this group about? Bible study throughout the book of John. Who is this group for? “Mostly Mature” Men and Women. When is this group happening? Fridays at 6:30 PM, starting October 5th. Tim Chappell has done a great job in recent years as our Family Ministries Director. Sunday, we were pleased to announce Tim will be moving into a full-time role as Associate Pastor of New Community Church. This new role will expand much of what Tim was doing in the ministries for students and children. It will also include being a part of the preaching rotation, as well as some administrative duties. The addition of Tim will help our church to continue to minister to the whole family. Family ministry has always been a part of the DNA of our church, so we are all grateful for God’s provision in this area. Tim is married to Jen, and they have two boys, Nathan and Landen. Tim’s looking forward to all God has ahead for New Community!